Misbits record shop will be open! from 12-8 pm with some nice beats from Bonbon, Crihan and Rotopoercutor. 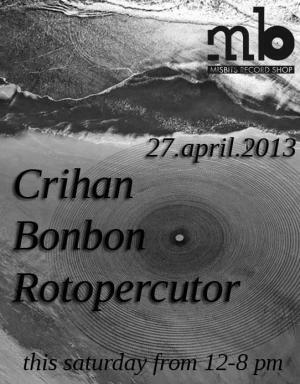 "Misbits Vinyl Saturday - Bonbon, Crihan and Rotopoercutor" Party in Bucharest. You can get here description, reviews, address, time and details of "Misbits Vinyl Saturday - Bonbon, Crihan and Rotopoercutor" Party in Bucharest. Visit Bucharest Tips for more Party events in Bucharest!